Sid is my first ever champion. Many years ago, I was looking for a show male. I seriously looked for about two plus years. Looked at many puppies, adults. Beautiful dogs. But none caught my eye. Well, one day, I emailed a breeder that I was looking for a boy. He sent me some pics. Did not like them, the same story as two years before. Then I have asked if he had young adult males. He did. Sent me the picture of Sid. Well, it took me 15 minutes and here, I found him. I flew out of state to get him. That was quite an adventure. I did not think that such a bond is possible with the adult dog. He definitely disliked me at first. I was the one, in love.He wasn’t. However, as the time went by, we became friends. He has the most balanced personality I have ever seen in the dog. He is not Mr Personality, he is very reserved- he likes to observe. But…when it comes to the show ring, he will go in and just show his heart out. He is usually the smallest in the ring. He is very small but heavy. He finished his championship at 11 months. Went to four shows, won three. That was a 5 point major each. Here he is a champ. 11 months. Then he continued his show career and became Grand Champion at the age of 23 months. 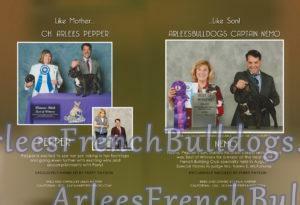 At that time, AKC just rolled out the Grand Championship program. He is one of the first fifty dogs in the country, who achieved GCH title. He is also shown by my daughter in junior handling. His children and now grand children can be seen in the show ring as well. If I would have to do it all over again, would do it in a heart beat. Sid showed me at the time when I did not know anything, what the show is made of. He is my beautiful friend, companion, show dog.